Mr. Salimbhai F. Patel appointed as a Chairman of managing committee for two years in society’s managing committee meeting. The first managing committee meeting of new term was held under the presidency of Mr. I. D. Patel (Vadodara) on 12-02-2019 (Tuesday). Meeting started with Tilavat-e-Quran by Haji Mahmud H. Vorajee then after Dua-e-Magfirah was prayed for all Marhooms. Minutes of last meeting has been read in meeting and all the members agreed on that minutes. Mr. Muhammad Abubakar Ashraf- Rander has recommended Mr. Salimbhai F. Palel-Alipor as the chairman of managing committee for 2 years which was supported by Mr. Ahmed Amla-Surat and accepted by all the members of committee. Names for different committees were announced. All memebers had given chance to write their names in their corresponding committee. All committees were formed unanimously by all committee members. Our Ex-member of Board of Council Janab Muhammad Ibrahim Sidat Sb. (Ankleshwar) passed away on 02-02-2019 at Dungri. Father of our member of Board of Council Mr. Zakariya Quari A. Hai Bhana Sb. passed away on 03-02-2019 at Itarva. Janab Yusufbhai Lakhi Sb. passed away at Panoli. He was father-in-low of well wisher of our society Janab A.Kadir Shehri Sb. (Canada). DEATH (INNALILLAH): Amina Ibrahim Bhula Kalakachhawala passed away. GONE: Ismail Ahmed Rawat (Aain) Thalawala went to India. Justice of Peace Salimbhai Lunat, Aminabahen Salimbhai Lunat, Ibrahim ahmed Sidat, Rashidabahen Ibrahim Sidat went to Alipor-India. Gulam Hasan Maniyar and Ayshabahen Maniyar went to perform Umrah. Honorable director Mr. M. M. Dalchaval sir received PEDAGOGICAL INNOVATION AWARD-2019 in the field of continues efforts towards GTU innovation council by our institute in various layers on dated 14th Feb 2019. This award is presented by GTU IINOVATION AND STARTUP CENTRE (GISC) under ANNUAL GTU INNOVATION COUNCIL AWARD-2019. A campus interview by leading tyre manufacturing company, MRF Limited was held on 13th February 2019 at A.Y.Dadabhai Technical Institute, Kosamba. 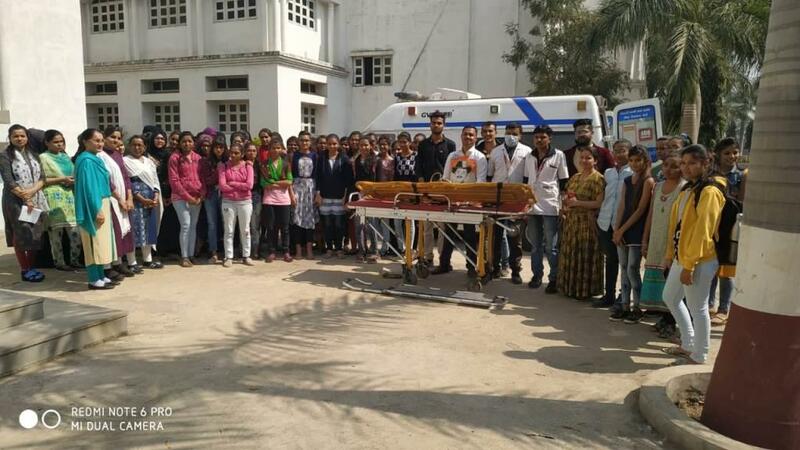 “Udaan – Women In Development Cell” of A.Y.Dadabhai Technical Institute, Kosamba has organized a programme on “Self Defense, Awareness about 108, 181 helpline and cyber sicurity Programme” with the help Sanskruti Samaj Seva Sansthan Trust, Bharuch on Saturday, 16th February, 2019. There is, we feel, a need for us SURTI SUNNI VOHRAS to have some written information on our past and present endogamous group members. As we know we lost over the years many thousands of our members through migration and we also know that we have no written records of who went where and when. Visiting some of our VOHRA villages we become aware of empty plots of land where the houses of some of those who migrated stood. Some of our villages no longer have families or individuals with certain family names or surnames. These family names or surnames have disappeared mainly through migration. If we try to find old village land records or if can get hold of old school registers or Nikah registers, we may find some information on our fore fathers who once lived in our villages. We feel we VOHRAS should remember in our DUAS all those from our endogamous group members who migrated and especially the first ones who took brave steps to leave their native places for countries of which they new little or nothing. Most of these men were without any education and had no language skills besides their own and knew about no other work but the work they did on their lands. Their short comings did not stop them. They went where they could go to in search of opportunities to earn and improve themselves monetarily. They were the pioneers who made migrating possible for all our future generations. We should thank them for the affluence we now see in our villages and we should thank them for the masajid, madaris, dar-ul-ulooms, high schools, electricity and water supplies which are to be seen in our villages. For some reasons which are most probably particular to our SURTI SUNNI VOHRAS we have never been interested in preserving or trying to preserve our social history. Even now If we visit some of our villages to seek information on any issue, we will not get very far. Some of those we approach or try to approach will shrug their shoulders without saying a word and walk away. Most of those we approach or try to approach will not show any interest in the sort of information we may try to seek. We feel our people's lack of interest has to a large extent prevented us from making enquiries and learning About our own people. We feel we must ask the ALMIGHTY ALLAH to help our VOHRA brothers and sisters to show more interest in the population changes that have taken place over the years and the changes taking place now. We feel we must develop an interest in learning about our fellow SURTI SUNNI VOHRAS. It is by developing our interest we will be able to pass on our social history to our coming generations. Besides this we feel the information will help our dar-ul-ulooms, high schools, tabligh jamaat, our VOHRA EDUCATION SOCIETY and our leaders to know of our people's development and progress and help towards giving guidance to our people where this is needed. We feel our VOHRA EDUCATION SOCIETY should encourage the information gathering we are suggesting. Our high schools as well as our dar-ul-ulooms could and should play important roles in encouraging their former students to participate in making the information gathering possible. Our dar-ul-ulooms and our high schools will have some of their past VOHRA students residing in the villages. Such former students, both males and females could get together and draw up a questionnaire which could be used for gathering information from all our villages. We feel the information gathering will help lay the foundation for a more intensive study in the future of our SURTI SUNNI VOHRAS. Such a study will allow us to know more about our people's past and present and hopefully allow us to determine with the ALMIGHTY ALLAH'S help the direction our people will be heading for in the future. 1.Name of the village. 2. Size of the Vohra population. 3. Total population. 4. Other Muslim population. 5. Actively engaged in agriculture. 6. Domestic animals owned by families for generating incomes. 7. Engaged in other types work. 8. Educational attainments both religious and secular. 9. Motor car, motor cycle, truck and tractor ownership. 10. Attendance at the masjid. 11. Participating in Tabligh activities. Those who decide to seek information and we feel there will be both our brothers and sisters who will volunteer to do so could add on other issues to their questionnaire and try to get a more representative picture of our village-based populations.